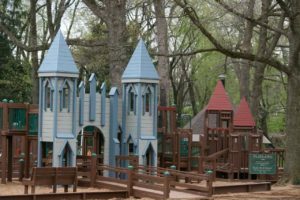 What child doesn’t dream about playing in a castle? 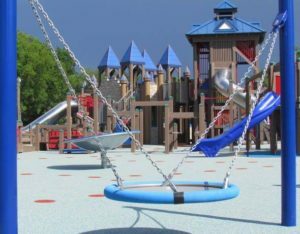 The castle is incorporated into playground’s main structure and will feature 6-foot-wide ramps (wide enough for 2 wheelchairs side-by-side). 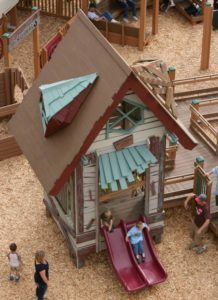 The ramps lead through the arched grand entry and beneath the playground deck, so children can choose to explore either the “dungeons” or “grand halls” of the castle. 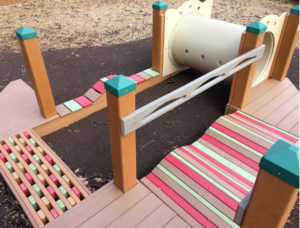 Knights and adventurers can race up the rainbow-colored maze of stairs winding up into the castle turrets were they will find slides to make their quick escape from “dragons” or “jousting opponents”. A zip line was one of the most requested items by the children. We want to make it double the fun! Our dual zip line will have two tracks with one disc seat and one ADA-accessible bucket seat. It will enable children who need additional support to fly 50 feet through the air alongside their siblings and friends, allowing everyone to experience play in a whole new way! 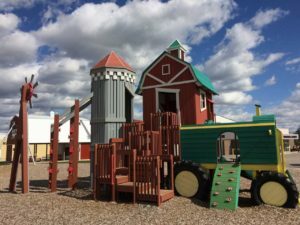 The barn with its whimsical architecture and decor, the barn is an imaginative play structure for little ones to explore as well as a reflection of Warwick’s culture and heritage as an agricultural community. 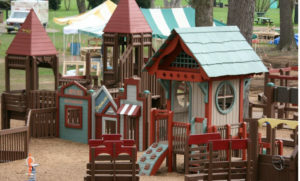 One of our goals is to give the children many options for imaginative play. Whether made out of blankets or lumber, children love playing in forts! 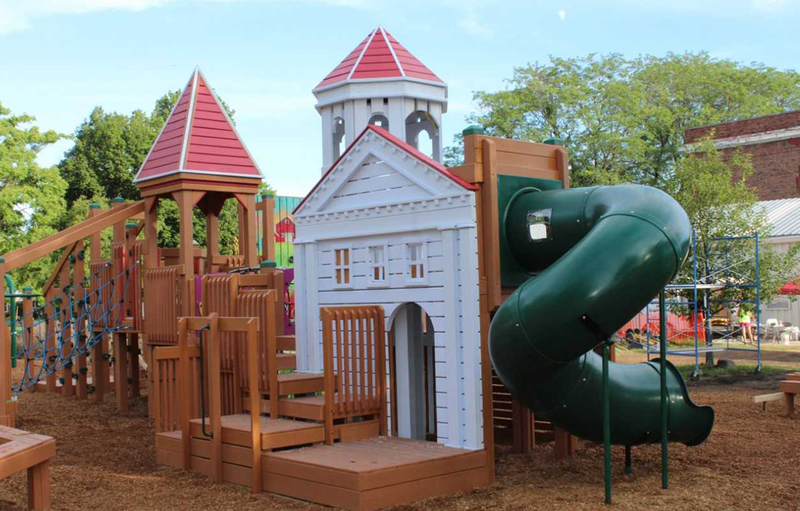 Thanks to Play By Design’s whimsical design, this accessible fort will make a fun starting point for adventures. The Climbing Net Spinner allows children to climb like “Spiderman” across steel-reinforced soft nylon ropes while rotating at a safe, controlled speed. The solid-deck floor provides an inclusive and safe place for children of all ages and abilities to join in the exhilarating fun, adding another dimension of imaginative, social and physical play. Traditional plastic slides generate static electricity which can negatively impact cochlear implants. A child with profound hearing loss/deafness that depends on cochlear implants to hear, can now slide with their friends without fear of an electrostatic discharge. 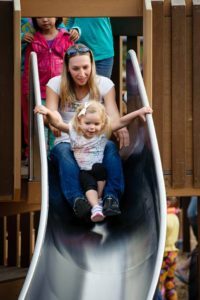 They also can experience the benefits that slides provide to the vestibular system which helps children develop a sense of balance. 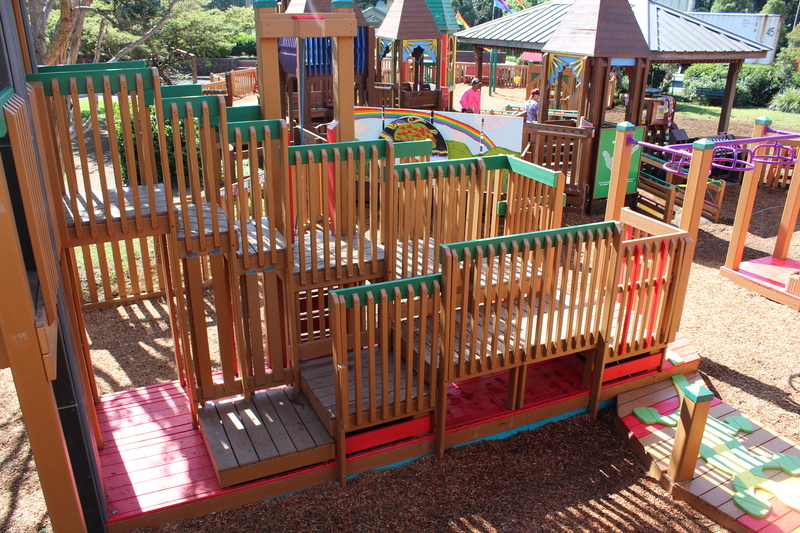 In our mission to create a playground for children of all ages, we are excited to include a ropes course for older children to test climbing skills and improve coordination, strength, physical development while creating a vehicle for imaginative play as they climb to the top of the jungle. The onion honors the legacy of our Black Dirt farms. 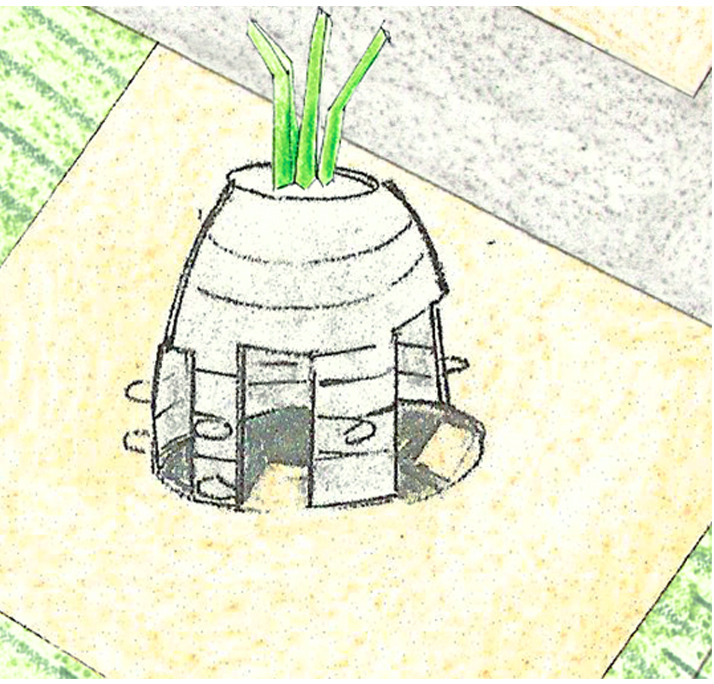 The whimsical onion-shaped structure situated on the edge of the play area creates a quiet space for kids to read, rest or engage in creative and unstructured play. It also provides a much-needed space for children with neurological and sensory processing challenges. 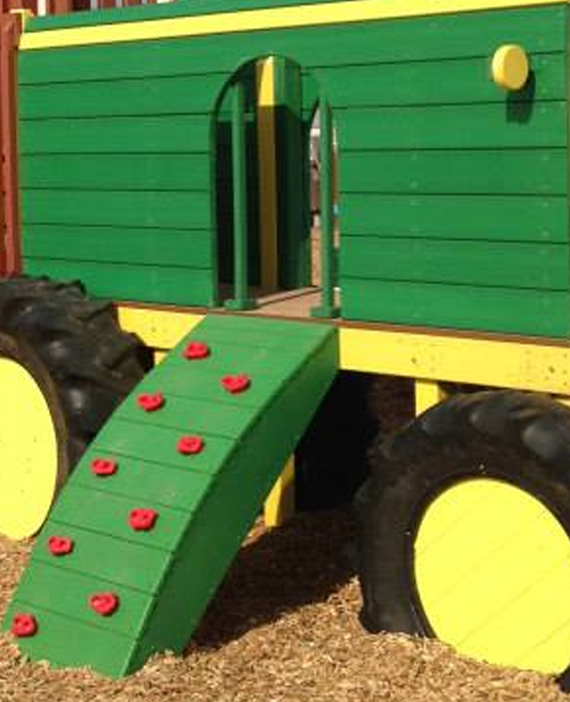 The tractor is wheelchair accessible and gives children of all abilities the chance to use their imagination to plow the fields or harvest the crops from the farmland they pass in our community every day. 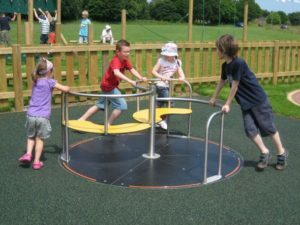 Placed at ground level and with space for wheelchairs, our merry-go-round allows all children to benefit from improved balance, spatial awareness, teamwork and the excitement of spinning with friends! 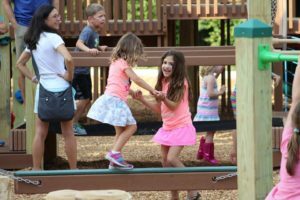 The orchards of Warwick play such an enormous role in defining our culture and creating memories for generations of children and families. 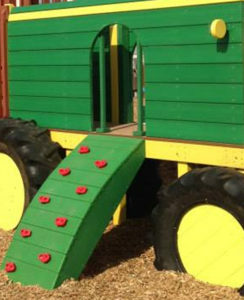 As a tribute to these farms, we’ve created a fun and accessible tree house nestled into an apple tree. Children can climb the arch, the rock-climbing wall, spiral pole or enter from the ramp and create new memories in unique Apple Tree House. The children told us repeatedly that they love to climb! 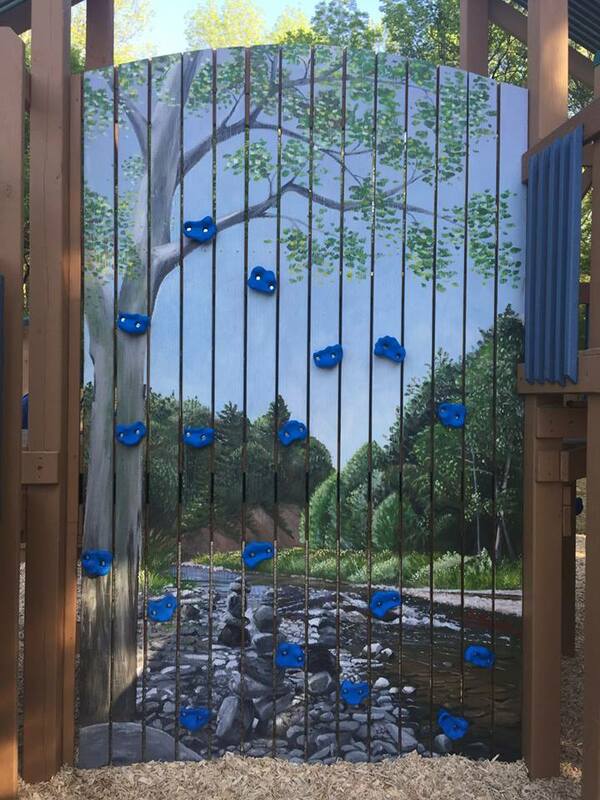 Our rock-climbing wall will give them a chance to challenge themselves as they scale a beautiful mural painted by a local artist leading to the Apple Tree House. 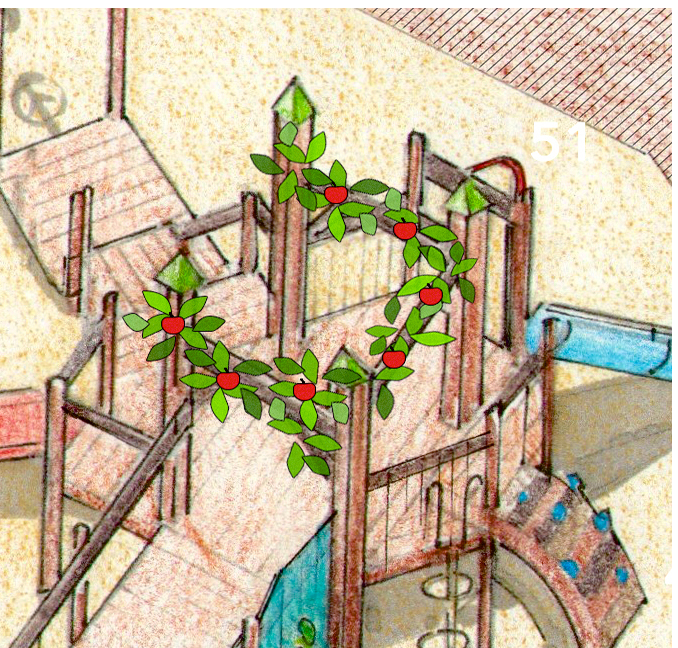 Once the children pass under the castle arch, they will be able to choose which way they want to clamber up into the castle. 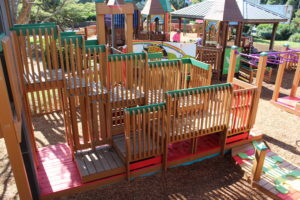 A maze of rainbow-colored stairs will lead up either side, giving the children many options to choose their own adventure or make their escape in a game of tag. 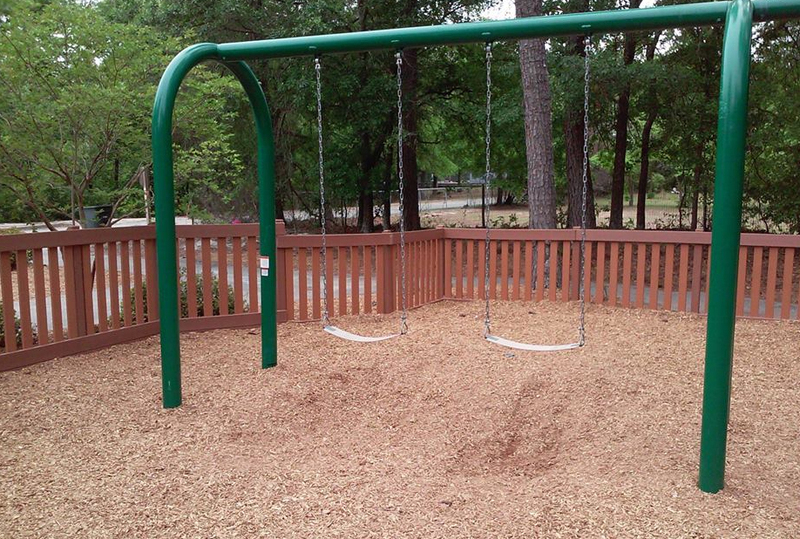 An adaptive swing that can accommodate multiple children as well as those with little or no trunk/motor control. It is great for imaginative and social play as the kids soar into the sky on their flying saucer! 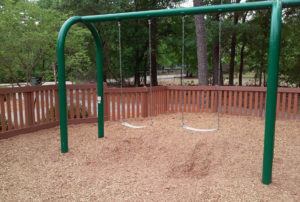 This is a fairly new piece of equipment that allows a caregiver or sibling to sit face-to-face across from a small child while they swing. 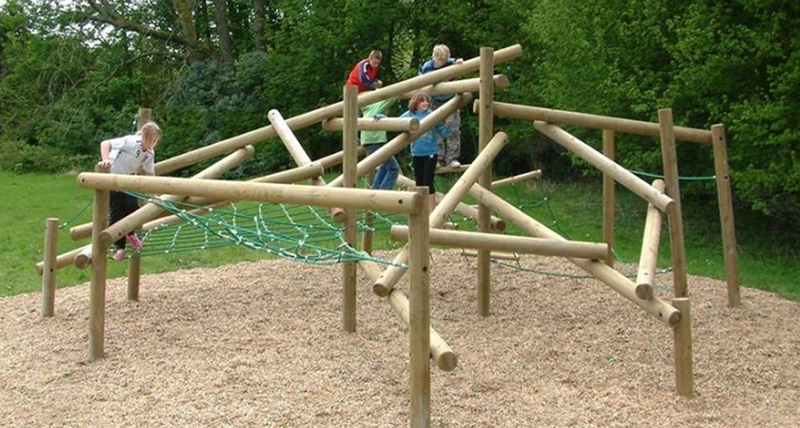 It creates an opportunity for attunement play which is important in the bonding process. It helps children build and maintain their relationships with others. This is a particularly valuable piece of equipment for young children with limited social skills. 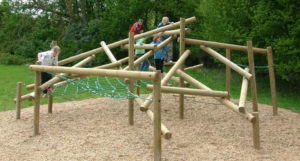 Swings are one of the earliest components of the childhood playground. 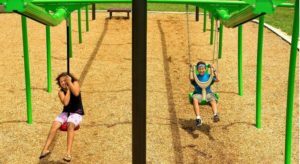 Swings not only help develop core muscular strength, they also stimulate our bodies’ sensory systems, namely our vestibular and proprioceptive systems. Most of us have countless childhood memories on swings. They are simultaneously calming and exhilarating and let’s not forget really, really fun! 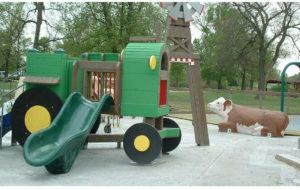 A charming tribute to our three villages in town as well as the hamlet of Pine Island. Our storefronts will be decorated by local artists to reflect Warwick’s heritage and culture across the villages and hamlet. 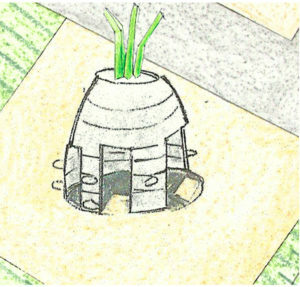 They will be accessible from both inside the Tot Lot as well as from one of the flat pathways outside of it. 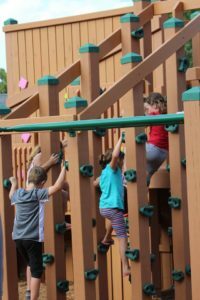 The Ninja Posts are a fun way to climb and engage in imaginative and body play, challenge children to navigate their way through the forest of vertical beams without touching the “hot lava” beneath them! 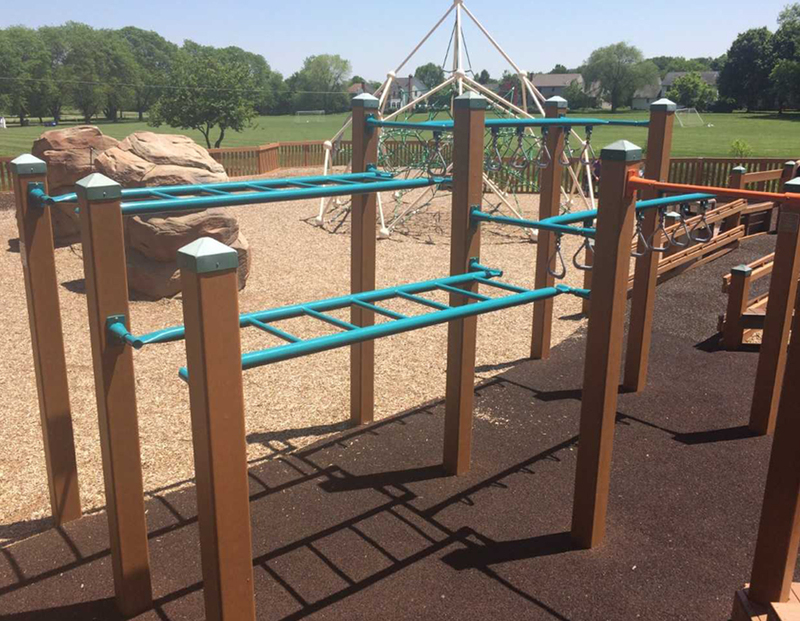 The ninja posts help build muscular strength and encourage children to develop better balance. 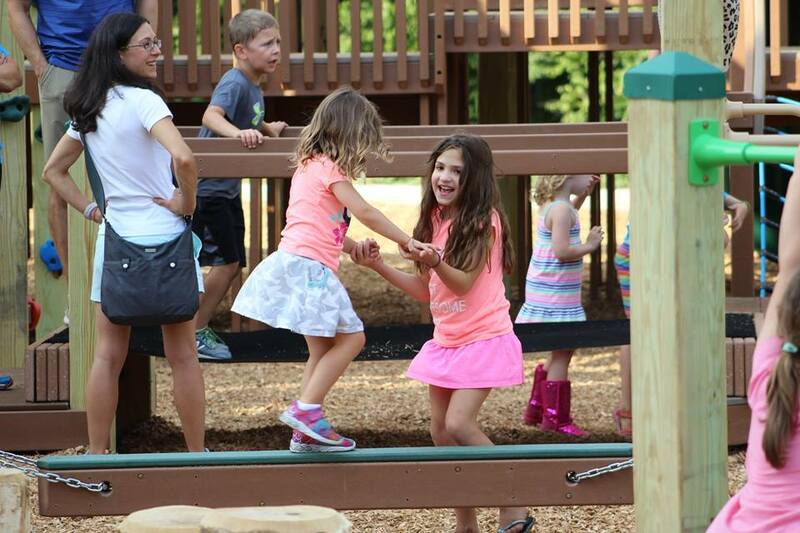 The Tot Lot’s Obstacle Course offers little ones fun-filled, safe challenges to help develop their balance and muscular strength and learn how their bodies work and move. The course features an arched rock climber, bouncy bridge, hops, tunnel, and wave bridge. Another popular request from the children was an obstacle course. 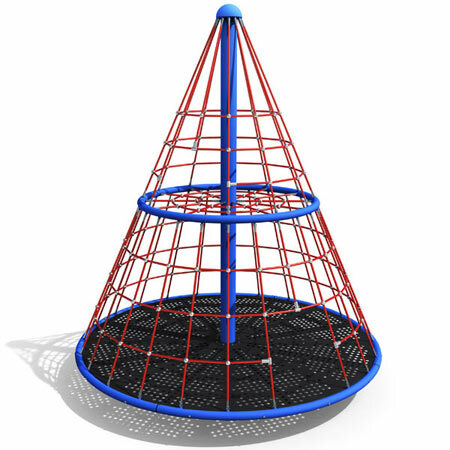 In addition to balance pods, a wiggle beam, and high and low gym bars, our obstacle course will also feature different types of monkey bars for our “ninja warriors” to traverse (ex: spinning, straight, trapeze ring, an up-down horizontal ladder). 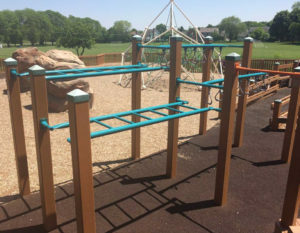 Additionally, the course will feature low monkey bars and trapeze rings to give those in a wheelchair an opportunity to get in on the fun and exercise their upper body strength. Transfer stations enable a person using a wheelchair to transfer out of their chair onto a structure. The transfer stations extend the areas of accessibility for those people in a wheelchair. More component details coming soon!